A general definition of complementation is the ability of two mutants in combination to restore a normal phenotype. Dominance observed in heterozygotes reflects the ability of wild-type alleles to complement loss-of-function alleles. You know that a dominant allele will determine the phenotype of a heterozygote composed of a dominant and a recessive allele. Often, recessive alleles are loss-of-function mutations, whereas the dominant allele is the wild type, encoding a functional enzyme. Using the example that led to Mendel's First Law, a cross between YY (yellow) peas and yy (green) peas yielded yellow peas in the F1 heterozygote (Yy). In this case the chromosome carrying the Y allele encodes the enzymatic function missing in the product of the recessive y allele, and the pathway for pigment biosynthesis continues on to make a yellow product. Thus you could say that the dominant Y allele complements the recessive y allele - it provides the missing function. We can continue the analogy to the classic cross for Mendel's Second Law. Let's look at the same genes, but a different arrangement of alleles. Consider a cross between round green (RRyy) and wrinkled yellow (rrYY) peas; in this case each parent is providing a dominant allele of one gene and a recessive allele of the other. The F1 heterozygote is round yellow (RrYy), i.e., the phenotypes of the dominant alleles are seen. But you could also describe this situation as the chromosomes from rrYYpeas complementing the deficiency in the RRyy chromosomes, and vice versa. 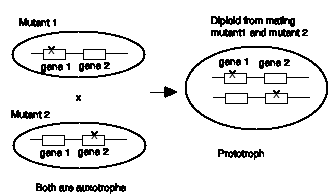 In particular, the Yallele from the rrYYparent provides the function missing in the y allele from the RRyy parent, and the R allele from the RRyy parent provides the function missing in the rallele from the rrYY parent. If the phenotype you are looking for is a round yellow pea, you could conclude that mutants in the R-gene complement mutants in the Y-gene. Since in a heterozygote, the functional allele will provide the activity missing in the mutant allele (if the mutation is a loss-of-function), one could say that dominant alleles complement recessive alleles. Thus dominant alleles determine the phenotype in a heterozygote with both dominant and recessive alleles. The ability of complementation analysis to determine whether mutations are in the same or different genes is the basis for genetic dissection. In this process, one finds the genes whose products are required in a pathway. In the examples from peas, the metabolic pathway to yellow pigments is distinctly different from the pathway to round peas, which is the starch biosynthesis pathway. Complementation analysis is useful in dissecting the steps in a pathway, starting with many mutants that generate the same phenotype. This is a more conventional example of complementation. Many fungi can propagate as haploids but can also mate to form diploids prior to sporulation. Thus one can screen for mutants in haploids and obtain recessive mutants, and then test their behavior in combination with other mutants in the diploid state. Let's say that a haploid strain of a fungus was mutagenized and screened for arginine auxotrophs, i.e. mutants that require arginine to grow. Six of the mutants were mated to form all the possible diploid combinations, and tested for the ability of the diploids to grow in the absence of arginine (prototrophy). The results are tabulated below, with a + designating growth in the absence of arginine, and a - designating no growth. As you would expect, when mutant 1 is mated with itself, the resulting diploid is still an auxotroph; this is the same as being homozygous for the defective allele of a gene. But when mutant 1 is mated with mutant 2 (so their chromosomes are combined), the resulting diploid has prototrophy restored, i.e. it can make its own arginine. This is true for allthe progeny. We conclude that mutant 1 will complement mutant 2. If we say that mutant 1 has a mutation in gene 1 of the pathway for arginine biosynthesis, and mutant 2 has a mutation in gene 2 of this pathway, then the diagram in Fig. 1.6 describes the situation in the haploids and the diploid. (Note that if the organism has more than one chromosome, then genes 1 and 2 need not be on the same chromosome.) Since the enzymes encoded by genes 1 and 2 are needed for arginine biosynthesis, neither mutant in the haploid state can make arginine. But when these chromosomes are combined in the diploid state, the chromosome from mutant 1 will provide a normal product of gene 2, and the chromosome from mutant 2 will provide a normal product of gene 1. Since each provides what is missing in the other, they complement. Mutant 1 will also complement mutant 3, and one concludes that these strains are carrying mutations in different genes required for arginine biosynthesis. Figure 1.6. Complementation between two haploid mutants when combined in a diploid. In contrast, the diploid resulting from mating mutant 1 with mutant 4 is still an auxotroph; it will not grow in the absence of arginine. Assuming that both these mutants are recessive (i.e. contain loss-of-function alleles), then we conclude that the mutations are in the same gene (gene 1 in the above diagram). We place these mutants in the same complementation group. Likewise, mutants 2 and 3 fail to complement, and they are in the same complementation group. Thus mutant 2 and mutant 3 are carrying different mutant alleles of the same gene (gene 2). Mutant 5 will complement all the other mutants, so it is in a different gene, and the same is true for mutant 6. Thus this mutation and complementation analysis shows that this fungus has at least 4 genes involved in arginine biosynthesis: gene 1 (defined by mutants alleles in strains 1 and 4), gene 2 (defined by mutants alleles in strains 2 and 3), and two other genes, one mutated in strain 5 and the other mutated in strain 6. Genetic dissection by complementation is very powerful. An investigator can start with a large number of mutants, all of which have the same phenotype, and then group them into sets of mutant alleles of different genes. Groups of mutations that do not complement each other constitute a complementation group, which is equivalent to a gene. Each mutation in a given complementation group is a mutant allele of the gene. The product of each gene, whether a polypeptide or RNA, is needed for the cellular function that, when altered, generates the phenotype that was the basis for the initial screen. The number of different complementation groups, or genes, gives an approximation of the number of polypeptides or RNA molecules utilized in generating the cellular function. Question 1.2. Consider the following complementation analysis. Five mutations in a biosynthetic pathway (producing auxotrophs in a haploid state) were placed pairwise in a cell in trans(diploid analysis). The diploid cells were then assayed for reconstitution of the biosynthetic pathway; complementing mutations were able to grow in the absence of the end product of the pathway (i.e. they now had a functional biosynthetic pathway). A + indicates a complementing pair of mutations; a - means that the two mutations did not complement. a) Which mutations are in the same complementation group (representing mutant alleles of the same gene)? b) What is the minimal number of enzymatic steps in the biosynthetic pathway? Note that all the diploid progeny fungi from the mating of mutant strains 1 and 2 have the ability to grow on arginine, and this complementation does not require any change in the two chromosomes (Fig. 1.6.). The only thing that is happening is that the functional alleles of each gene are providing active enzymes. If genes 1 and 2 are on the same chromosome, at a low frequency, recombinations between the two chromosomes in the diploid can lead to crossovers, resulting in one chromosome with wild-type alleles of each gene and another chromosome with the mutant alleles of each gene (Fig. 1.7). This can be observed in fungi by inducing sporulation of the diploid. Each spore is haploid, and the vast majority will carry one of the two parental chromosomes, and hence be defective in either gene 1 or gene 2. But wild type recombinants can be observed at a low frequency; these will be prototrophs. The double-mutant recombinants will be auxotrophs, of course, but these can be distinguished from the parental single mutants by the inability of the double mutants to complement either mutant strain 1 or strain 2. Note that this recombination is a physical alteration in the chromosomes. The frequency of its occurrence is directly proportional to the distance the genes are apart, which is the basis for mapping genes by their recombination distances. Recombination occurs in a small fraction of the progeny, whereas all the progeny of a complementing diploid have the previously lost function restored.